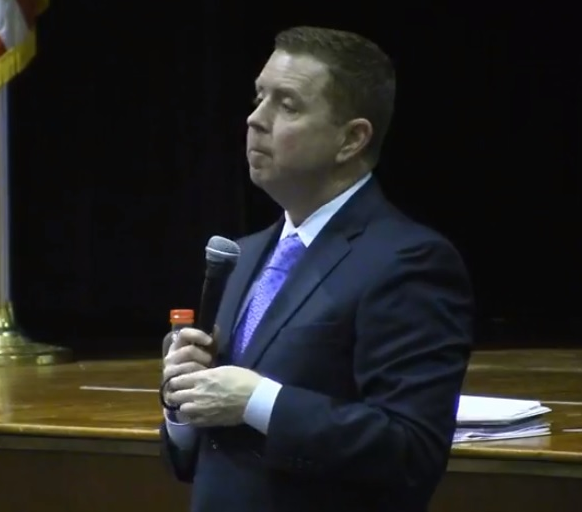 A 25-year Township resident told parents at Thursday night’s referendum meeting that if they care about their children’s educational future they need to vote March 13. Her message to parents comes just weeks before residents are set to vote on a $68.8 million referendum question, that if approved, would construct a second middle school in the district to address a rapidly increasing student population. Superintendent Michael Kozak said Friday, that while he understands many seniors live on a fixed income and may be hesitant to support the $68.8 million plan, past voting shows support from that population group. “Senior citizens are sometimes painted as not being supportive of education, but I challenge that because a lot of them are supportive of education and they are really vocal about it,” he said. District officials say student enrollment will increase by approximately 1,500 in five years, further straining capacity at the current middle school, leading to officials to take several temporary solutions, such as classroom trailers and converting non-instructional spaces in to classrooms, to address enrollment. The trailers for the middle school will be operational in the fall. The rising enrollment has created a financial burden on some in the district. The middle school referendum is just the latest major project the district has attempted since 2003. The district has built a new high school, which also includes space for an expansion, and a new elementary school. Kozak said Friday that he understands the financial concerns some community members would have after two referendums were passed in the 2000s coupled with the potential middle school project and two additional bonding measures in the near future. In 2006 and 2007 voters approved $26.8 million for a new elementary school and $41.9 million for the high school. Attendees were also concerned about future costs for additional referendum projects. The district has made it clear that the middle school project is just phase one to address enrollment needs. However, at the meeting Gerald Tague, the district director of facilities, noted that those figures weren’t available, but he would let the Board of Education know about attendees’ request. “Unfortunately, there really isn’t an available cost estimate,” Kozak said, adding that the district would not want to suggest a figure for future projects and have it come across as being misleading when a more concrete figure becomes available. The $68.8 million project would build a new middle school on a 35-acre lot. The state has earmarked $7.1 million in debt-service aid to reduce the tax impact on homeowners, should the referendum pass. The new school would be built on township land at 54 Applegarth Road. The site is currently home to a golf center. The township acquired the land through the eminent domain process and plans to deed the site to the district at no cost.